The Best Food, Service & Live Entertainment Southwest Florida Has to Offer! Danny Sinoff was born in Massachusetts and grew up in Naples, FL. He studied classical piano since the age of two. At 17, Danny discovered jazz, to which he applied his classical technique and creative energy, later developing his own personal jazz vocal style. After graduation from Barron Collier High School, he attended the Berklee College of Music in Boston pursuing a degree in Piano Performance and Music Technology. After a year, Danny decided to return to Naples, where he gained invaluable experience working with professional musicians. Danny’s musical influences include Keith Jarrett, Oscar Peterson, Kenny Barron, Brad Mehldau, Benny Green, Bud Powell, Bill Evans, Sarah Vaughan, Wynton Kelly, Harry Connick, Jr. and especially Frank Sinatra. He has performed with David “Fathead” Newman, Jimmy McGriff and The Brubeck Brothers Quartet. Beginning in 2006, Danny’s quartet was the headliner act at Ellington’s Jazz Club on Sanibel Island, FL. His 2007 CD release for Ellington’s featured Fathead Newman and trumpeter Dan Miller. Danny has appeared at the Apollo Theater in New York City and at the Syracuse Jazz Festival. 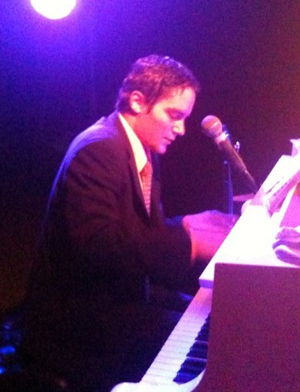 Sinoff led a trio and quartet at Ellington’s until 2010, when he joined us at The Roadhouse Cafe. The Danny Sinoff Trio at the Roadhouse includes Philadelphia veteran Tony Vigilante on drums (Saturdays) and Patricia Dean on drums (Wednesdays). “Jazz Monday” at the Roadhouse Goes Out With a Bang! Joe Delaney at The Roadhouse Cafe!